More and more people are replacing missing teeth with dental implants. This choice of treatment is a permanent solution to replace missing teeth and the feel and look is as natural as your own teeth. 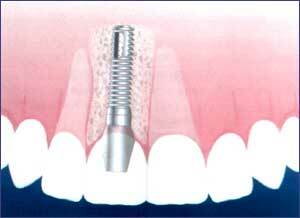 An implant is an “artificial root” made of titanium . The implant is surgically placed into your jawbone and left to integrate with the bone. After healing for 4-6 months a post is placed into the implants, and a porcelain crown is cemented on the post, to match your smile perfectly.